Cherokee rose hips (Jinyingzi)-Rosa laevigata Michx. Botanical Name: Rosa laevigata Michx. Source of Earliest Record: Shu Bencao. Part Used & Method for Pharmaceutical Preparations: The ripe fruit is gathered from September to October. After the fruit pits have been removed, the fruit is cleaned and dried in the sun. 1. Deficiency of the kidneys manifested as seminal emissions, nocturnal enuresis or leukorrhagia. 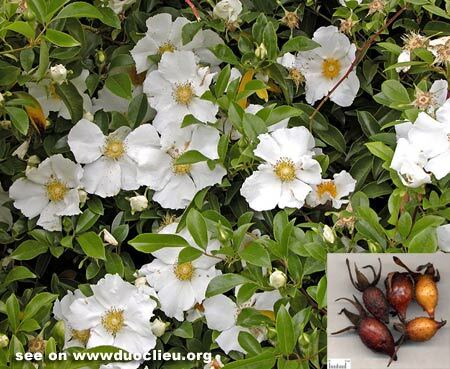 Cherokee rose hips (Jinyingzi) is used with Euryale seed (Qianshi) and Dadder seed (Tusizi). 2. Chronic diarrhea due to deficiency of the spleen. Cherokee rose hips (Jinyingzi) is used with Pilose asiabell root (Dangshen), White atractylodes (Baizhu) and Dioscorea (Shanyao). Cautions & Contraindications: This herb is contraindicated in cases with excessive fire or excessive pathogenic factors.